Summary: Chance of severe weather over the next few days. Small rain chances continue through the rest of the week. For today, we have partly cloudy skies with a 20% chance of storms. Our high temperature will climb to about 94 degrees, putting our heat index around 104. Winds will be out of the west at 5 mph. We have two different weather hazards to contend with today: heat and severe storms. 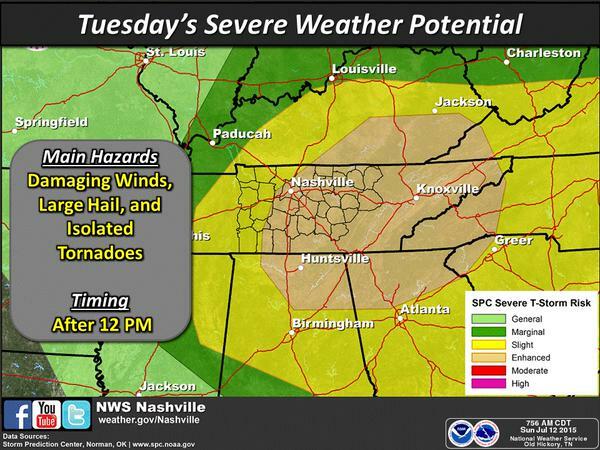 Here’s NWSNashville’s HAZARDOUS WEATHER OUTLOOK. ALTHOUGH SOME LARGE HAIL CAN NOT BE TOTALLY RULED OUT EITHER. DRINK ENOUGH WATER TO KEEP YOUR BODY HYDRATED. It’s going to be a warm one with the heat index in the mid 100’s. Be sure to keep you and your family safe when outside: drink lots of water, take frequent breaks, and try to avoid the hottest part of the day between noon and 3pm. The Storm Prediction Center has placed us under a MARGINAL risk of severe weather today. 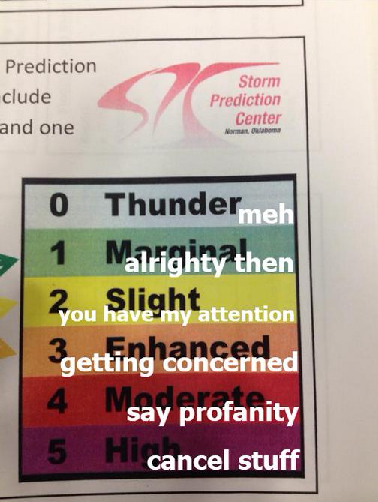 On the scale of 0 to 5, this means we are a 2 for severe weather. Here’s another way to look at the severe weather risks. Keep this picture in mind as we continue our update here. The HRRR and NAM4 doesn’t seem too impressed with our rain chances today, let alone severe weather chances. Below is the HRRR loop starting at 9am and going through 11pm today. NAM4 pretty much shows the same thing. Most of the action for storms will be east of I65. If we happen to catch a storm in Hickman County and it gets ugly enough to be severe, the main threat will be damaging winds and large hail. But that’s a big if if you want to believe the models. However, the models have been wrong before. We will keep an eye on it today to see if anything gets ugly and will be giving you updates on @HickmanSevereWx Twitter. Tonight, temperatures will fall to about 74 degrees under partly cloudy skies. Rain chances are 20% before 1am. Winds will turn from the west to southwest at 5 mph. Monday, the day starts off mostly sunny with our high temperature climbing to about 95 degrees (heat index will be about 104). A 20% chance of storms comes in after 1pm. Winds will be out of the west southwest at 5 to 10 mph. We will still be battling the same two weather hazards for Monday as well. 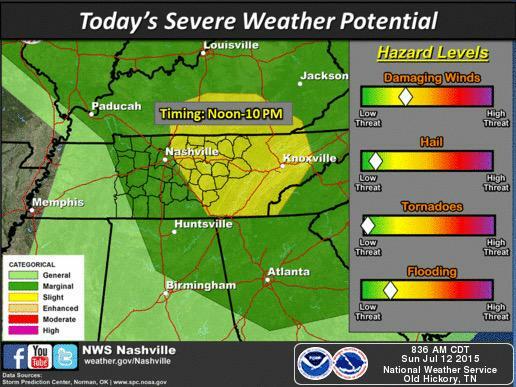 Here’s NWSNashville’s HAZARDOUS WEATHER OUTLOOK. WINDS...ALTHOUGH SOME LARGE HAIL CAN NOT BE TOTALLY RULED OUT EITHER. OCCUR WILL BE DAMAGING WINDS...LARGE HAIL...AND ISOLATED TORNADOES. SURE TO DRINK ENOUGH WATER TO KEEP YOUR BODY HYDRATED. The Storm Prediction Center has placed us in the SLIGHT category for severe weather already for Monday (Day 2). I mentioned the scale of 0 to 5 earlier. This would be a 3 on the severe weather scale. NAM4 doesn’t really show any impressive storm development for Hickman County either. Most of the activity still remains east of I-65. However, again, models can be wrong. We will keep an eye on this too. 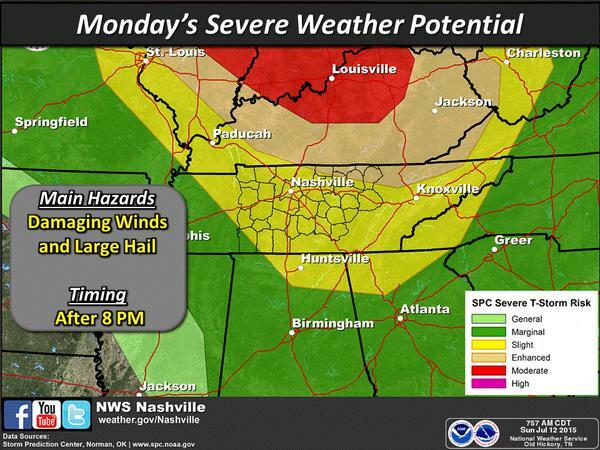 Best chance for severe weather appears to be after 7/8pm for Monday. Overnight Monday into Tuesday, rain chances stay at 20% chance with the overnight temperature falling to 75 degrees. Winds remain out of the west southwest at 5 to 10 mph. Tuesday, storm chances increase to 40% with our high temperature reaching about 93 degrees. If it isn’t storming, it will be around partly cloudy skies and breezy, with winds out of the west at 10 to 15 mph. The Storm Prediction Center for Day 3 (Tuesday) has placed us on the SLIGHT/ENHANCED category for severe weather. We are mostly in the SLIGHT category (yellow), but some of the county is right inside of the ENHANCED category. Since storms don’t stay neatly inside the SPC determined categories, I’m treating it as though the entire county is in the ENHANCED category just to be safe. 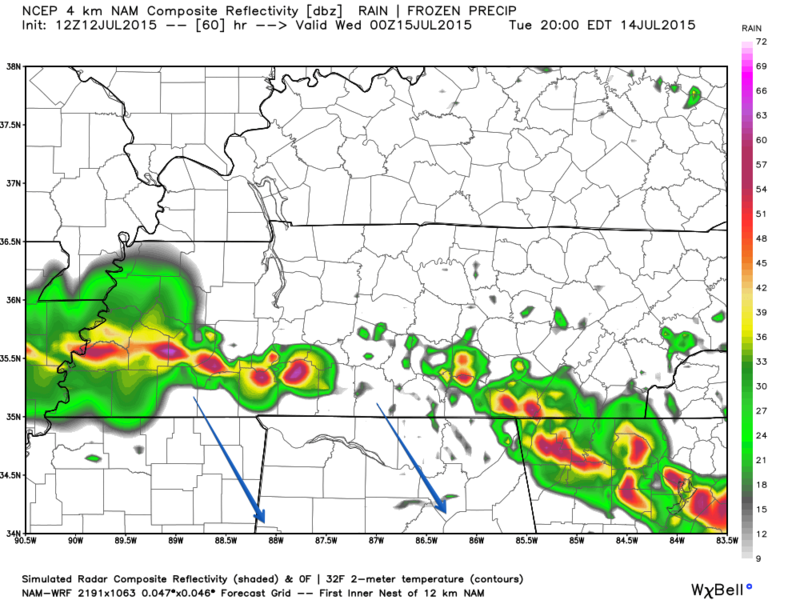 NAM4 is showing some storms close to us around 7pm Tuesday evening, but that’s about all it’s telling us. It’s almost out of range for this model, so it will likely change quite a bit between now and Tuesday. We’ll watch it though. Tuesday night rain chances are 30% before 1am. Temperatures will fall to about 74 degrees under partly cloudy skies. Winds calm to about 5 to 10 mph out of the southwest. Wednesday – Storm chances remain. Not outlooked for severe weather, yet. Wednesday and Wednesday night storm chances remain at about 20% with a daytime high of 93 and an overnight low of 74 degrees. We aren’t outlooked for severe weather yet for Wednesday (Day 4). We will see if this changes tomorrow. 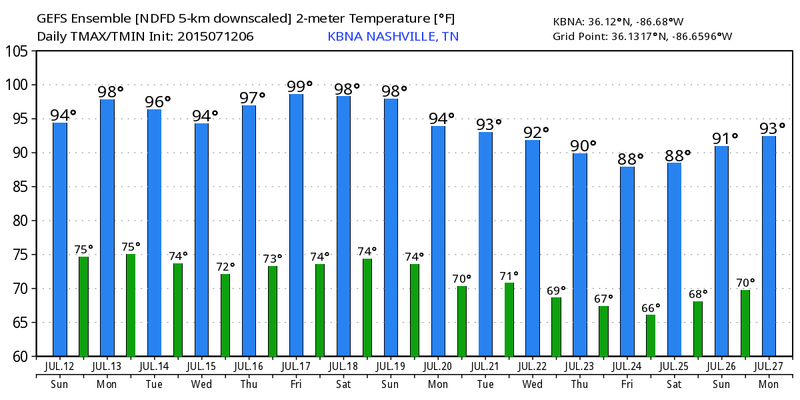 Unfortunately we will continue this bit of mid-90’s temps for at least the next 10 days. The weekend of the 24th looks to be pleasant with high-80’s temps. This could change, however, but at least there is some relief from the heat in sight.